Vancouver, in high-def and time-lapse, equals beauty. The Innerlife Project has released their first, and hopefully not their last, video piece, blending HD time-lapse video of Vancouver and a dreamy ambient soundtrack into a love letter to the city. When people ask me why I moved to Vancouver, I’ll have to remember to send this to them. Posted in Around Town, Arts, Enviroment, Music, Photography, video, Weather | Comments Off on Vancouver, in high-def and time-lapse, equals beauty. Ever wanted to enter a literary contest? Ever talked yourself out of it because you couldn’t imagine yourself writing pages and pages of stuff that made sense? Well screw that! Why not write a story that fits on a postcard? Send us a post­card along with a story that relates to the image. The rela­tion­ship can be as tan­gen­tial as you like, so long as there is some clear con­nec­tion to the image or place. Maximum length: 500 words, fic­tion or non-fiction. “Love, marriage, fidelity – what’s the real thing? In this play of marital maneuvering, Britain’s preeminent playwright explores the mysteries of love, commitment, and authenticity.” – Arts Club Theatre. Generally, when I read a synopsis such as this, I cringe in anticipation of the pretentiousness I’m about to bear witness to. I caught this play last Saturday, and it is hilariously funny. Written by Tom Stoppard (whose credits include Rosencrantz and Guildenstern Are Dead and the screenplay for Shakespeare in Love), the play centers around Max and Annie, and their taste for infidelity. Think Closer, substituting tears for hysterical laughter. Tickets range from 25-40 dollars, playing now at the Granville Island Stage, courtesy of the Arts Club. At least I’m assuming it’s art. From the Canada line platform, you can see a big banner featuring the Google homepage. I thought it was an ad at first. However it’s surrounded by a half dozen cardboard placards with various other sites on them – Facebook, MySpace, etc. In a town where you can learn to make everything from buttons to video games (and, oh, science and stuff), it takes a lot to stand out as particularly cool. Personally, learning to make comics ranks pretty high. Local scribbler of note, Steve Rolston is rapidly filling up open spots for the three classes he’ll be teaching this year (starting as early as January 12th.) If you’re looking to learn something new or perhaps fill in a few blanks and remove the final hurtle to making your very own comicbook, perhaps this is for you. In this course, students will be guided through the various stages of creating a four-page comic, including: script writing, character design, thumbnailing, penciling, inking, page structure, panel composition, and storytelling. Students will be using Adobe Photoshop software to add lettering and greytones to their artwork, and explore how to develop a plan for pursuing their personal aspirations within the medium of comics. Students in this course should have strong drawing skills, and submit a small portfolio upon registering. Those with minimal drawing experience can take our other courses in Basic Drawing or 2D Animation before taking this course. You should budget approximately $50 for art supplies. This course is taught by an award-winning comic book artist whose credits include Emiko Superstar, The Escapists, One Bad Day, Pounded and Queen & Country. Here’s a PDF overview of the course [pdf], which goes into even more detail than the link above. Q: When do you get when you cross three weeks of snow and 4°C temperatures? We’re asking for your help – if there is a catch basin [i.e. sewer grate -cas] in front of your property that hasn’t yet been cleared, please clear it off to help the water run off. Also, to protect your property, make sure that your gutters, drains and any drains serving sunken patios or roof decks are clear. If you have a basement or garage, take any precious objects up off of the floor in case there is some flooding. If you’re concerned about snow on your roof, please do not clear it off yourself – hire a professional. There are, according to the City webpage, 40,000 drains in Vancouver – even at a steady pace, there’s no way City crews can clear them all quick enough to avoid bigger trouble. So, grab a shovel, pretend your ten again, and go play in a puddle, yeah? City art – Eagles, bears, and tadpoles? I’ve had in recent days three things sloshing around in my brain, all of which I only realized today are all thematically connected, as they are all, for lack of a better term, city art. Which is to say it’s not urban art (graffiti, posters, building murals), or art about the city, but art that exists only because the city allows it to exist as part of the city. The first is an old throwback, which is one part world’s-lamest-scavenger-hunt (as there is only one thing to find and you win nothing… plus, I tell you where to look, so, not much actual hunting) and one part segue. Remember those Spirit Bears that dotted the city a couple of years back? Well, I think there’s one on the roof of the optometrist shop, South-East corner of Broadway and Quebec. It’s either that, or I’m hallucinating. Either could be fun. And there’s the segue, as this year the City of Vancouver and the BC Lion’s Society has unveiled the third animal in their Spirit of Art series (after the aforementioned bears and the Orcas from 2004) -the Eagle. I only became aware of this because you can’t miss the pastel blue bird sitting outside City Hall as you pass it. And as much as I’m in favour of helping the children (more on that soon), I’m not a big fan of the Eagles – the choice to put them upright on a wingtip seems awkward, and in fact it took me a second to register that it was a bird. But, there are still a lot of birds to go (the city will be rolling them out over 2009 and right up to the start of the Olympics) and part artists have made some amazing works – Darth Vader bear? Bookshelf Orca? 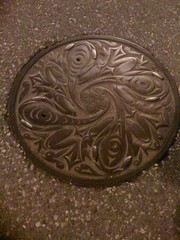 Finally, how did it miss that we have art manholes? Walking down Main Street the other night I literally tripped over the tadpole (frogs? fradpoles? togs?) design as I was crossing at King Edward (East side of Main, South side of King Ed), and a little research revealed there were two designs – anybody know where I can see the bubbles design? As cool as they are (well, the fradpoles at least), I like the traditional Chinese decorations in one. The salmon and raindrops on water is nice, and the woodgrain idea was inspired – totally should have gone with that one? What else is out there? I think we should start sharing more of the artistic bits and bobs we see around town – send us your flickr links! Taking advantage of the KRAZY! show at the Vancouver Art Gallery, a massive selection of local artists, big and small, along with tables and tables of dealers are going to be gathering this Sunday , August 24th. And you’re invited! Between 11Am and 5PM you can come meet the artists and peruse the swag for the way too reasonable price of free! The list is way too long, but you can find out who all will be there at the official website! Regular rates still apply if you want to check out the KRAZY exhibit.